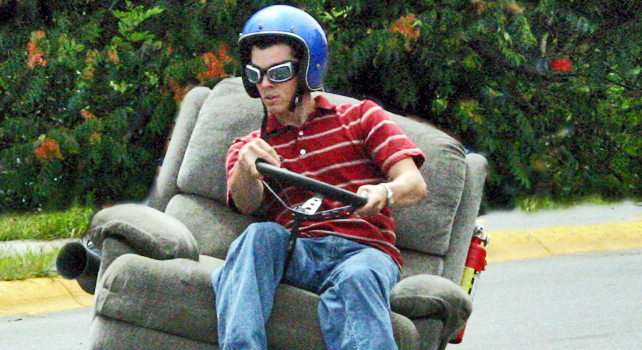 Twitter and NASCAR are debuting a new augmented television project for Sunday’s Pocono 400. The partnership goes way beyond hashtags. NASCAR and Twitter are unveiling a new sports product at the Pocono 400 race on Sunday, June 10: A co-branded racing page for fans to follow the event in full-time. 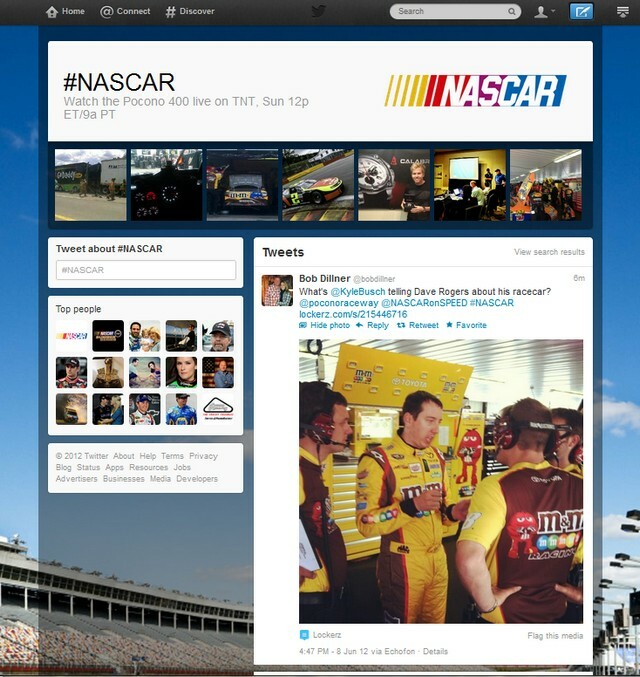 The #NASCAR page, which will be accessible at twitter.com/#nascar, is designed for fans to use as a companion for the race. It will be promoted at the racetrack and on television, and is one of Twitter’s biggest forays into both curated content and augmented television. While it’s a boon for Twitter’s sports department, the biggest beneficiary is NASCAR. The venerable stock car racing league is at the forefront of an ambitious Twitter content expansion. To promote the race, the Pocono 400 will be renamed the “Pocono 400 Presented By #NASCAR.” The page offers a brand-new Twitter interface that prominently features photographs and is optimized for quick navigation. Twitter Sports and Entertainment’s Omid Ashtari, one of the main developers of the project, told Fast Company that the #nascar page will use a new, stripped down design optimized for Twitter users who are unfamiliar with the platform. Promoted (i.e. paid) tweets will show up in search results. According to Twitter’s Elaine Filadelfo, the behavior of NASCAR fans on Twitter is different from many other sports–instead of tweeting about their team’s game, everyone wants to talk about the same race en masse. The #NASCAR page will be curated by Twitter employees, with a custom mix of tweets from racing personalities, organizations, family members, and sponsor promotional accounts. Users will see a timeline made from a mixture of old-fashioned human selection and algorithms. #NASCAR is already up as of press time in soft launch; #NASCAR will also be promoted heavily on the TNT television network. TNT, which airs NASCAR races, will integrate the #NASCAR page into their broadcast. #NASCAR is also going to be live in conjunction with five other races aired on TNT. For both Twitter and NASCAR, symbiotic growth is a big priority for the partnership. NASCAR has been outspoken about their efforts to expand the fan base for stock car racing, with an in-house market research department and outreach efforts targeting teenagers, African-Americans, Hispanics, women, and a host of other demographics. In terms of new promotional efforts, the Twitter partnership’s the latest in a long line of non-traditional NASCAR products: Back in 2006, NASCAR and Harlequin began publishing racing-themed romance novels in hopes of capitalizing off the women who comprise more than 40% of the sport’s fan base. NASCAR also has a sports culture that emphasizes open access (or at least the illusion of open access) between fans, drivers, pit crews, and owners. Drivers are encouraged to tweet frequently, and NASCAR’s digital team coaches drivers, pit crews, and owners in social media best practices. In an interview with Fast Company, legendary NASCAR driver Jimmie Johnson described how he used social media to keep in touch with fans and help fans see a side of him outside of racing. It was also a valuable look into how prominent athletes actually use social media: Johnson says he posts to Twitter and Instagram himself, but his Facebook page is a mix of self-written post and content from his staff. Twitter is also eager to expand into new markets and enhance the microblogging service’s reach. Although the best digital minds in the nation are unsure what exactly Twitter’s long-term profit model is, the company has aggressively launched new products and positioned the service’s reach both globally (new foreign language versions) and cross-platform (with aggressive upgrades to mobile products and purchase of third-party services). Twitter liaisons work aggressively in government, Hollywood, sports, and other sectors to both attract high-profile users and maintain relations with influential corporations and organizations. And now they’ve worked their way into the pit stall too.